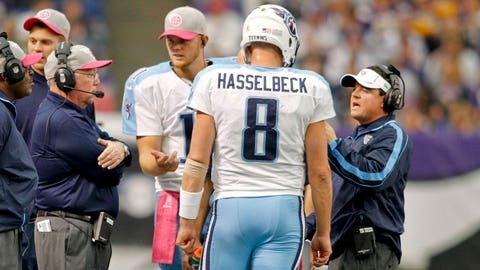 Tennessee Titans quarterbacks coach Dowell Loggains (right) talks with quarterback Matt Hasselbeck (8) as quarterback Rusty Smith (11) and Offensive Coordinator Chris Palmer listen during a break in the game with the Minnesota Vikings at the Metrodome. The Vikings win 30-7. According to Ian Rappaport of NFL Network, Mike Pettine has added to his coaching staff by hiring former Titans offensive coordinator Dowell Loggains. Loggains is reportedly either taking over as the quarterbacks coach or offensive coordinator, but the team has not decided which position yet. His tenure with the Titans lasted just over a year and he was let go at the end of this season with head coach Mike Munchak. Early this week, it seemed as if the Browns had targeted former Redskins offensive coordinator Kyle Shanahan, but Rapoport believes they have decided to go in a different direction. Loggains will be the Browns quarterbacks coach, not offensive coordinator per report.